Script writers: Karmen R., Orestov O. 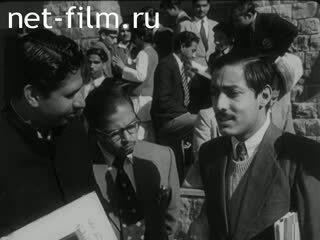 Operators: Kayumov M., Kiselev V., Medynskiy S., Mukhin E., Akkuratov E., Generalov N.
The overview film telling about the history of India, struggle for independence and present of the country. 1h. -History of India. 2h. - Fight for Independence (Chronicle). Celebration of Independence Day (August 15) on the streets of Delhi. Military parade. The first five-year plan and long-term plans for economic development. 3h. - Weekdays farmers of Punjab. Agricultural policy of the government. Bombay textile work. Raj Kapoor in the studio. 4h. -University of Bombay. Steel plant in Bhilai. 5h. - Nature India. Flora and fauna. Rubber plantations. Channels in the state of Travancore-Kochy. The life of fishing villages on the coast. Indian market. 6h. - City and State of Madras. The art of classical dance. The principal religion of the Indians - Hinduism. Folk Art: chasing, carving, production of Kashmiri shawls. 7h. - The holiday "Holi" - the meeting of spring. Kolkata: a museum and a library. The story of Rabindranath Tagore. Different plans - landscapes, etc. Religious bathing in the Ganges. The construction of the dam. The cave temples of Ajanta and Ellefy. Inside view of the temple. Ashoka Column - Facts of New India. Palace rooms of the Delhi Red Fort. The Shrine of the Taj Mahal in Agra. Great Mosque of Dzhaila Maggia in Delhi. Wall of the ancient fortress ..
Fort St George in Madras. Monument warrior woman Lakshmi Bai. Gandhi comes out of the wagon train. Dispersal of a demonstration Nehru in his youth. Meeting of the National Congress. Speech by Nehru and Gandhi (historical chronicle). August 15, 1947 over the walls of the Red Fort Nehru raised the flag of independent India. The people at the walls of the Red Fort. Last British troops leave India. People are going to the brochure "The way the state." The people welcomed the President of India - Rajendra Prasad. The National Planning Commission - Nehru at the map of India. Construction of irrigation facilities Bhakra-Nangal. Workers, engineers at work on the construction. The chief of construction Khungar, technician team Amarnaty drillers working. Shramadan - a massive clean-on construction. The water in the fields. Farmers in the field working. Honorary Elder Vinoba Bhave comes with peasants singing preaching, talking to farmers. Farm Taran - in Uttar Pradesh (state). Sonepat village - a new village near Delhi. Management of the village - council "Pongal" at work. Park at Malabar Hill in Mumbai. Coastal Avenue in Mumbai "Gateway of India". Textile workers go to work. Filming - Raj Kapoor and Nargis on the shooting. The building of the University of Bombay. Vice President of India Dr.
Radhakrishnan - Rector of the University. Students of the Faculty of Russian. Student reads a passage from "Eugene Onegin" (synchronous). Students of the Faculty of Medicine. Bombay Institute of Tropical Diseases. The head of the laboratory of Dr. The building of the nuclear power plant. Bhaba directs work in the field of nuclear energy. Construction of the dam, a metallurgical plant. At work - U.S. experts, the Soviet Union and other countries. On the construction of steel plant run Russian engineer from Sverdlovsk N. Boyarinkov, from Dnepropetrovsk - Engineer G. Strelmah, Indian engineer Menon. Plaque with the inscription "Here is the first blast furnace." Plans of the old smelter. The cameraman shoots in the jungle. Different animals in the jungle. The plantation work, children, women - gather tea leaves. Alleppey - "Venice of the East." Peasants at work in the southern state of Madras. The villages of fishermen along the coast. Teddy bear "Snowball", presented by the inhabitants of Madras Moscow Zoo. Sculptural decoration of the temple. Dance in the classic style "Bharat Natyam" performs talented dancer Kumari Sarraj. Master of dance Ramaiah Pillay educates young dancers. Bengal girls dance "Holi" welcome spring. People smear each other powders. Girls smear Indira Gandhi powder. Residents of the capital in the garden of Nehru. Calcutta - the capital of West Bengal. Jute loading the boat "Kim" at the port. The street and the house where he lived and worked Rabindranath Tagore. The table that worked Tagore. Tagore's poems - the anthem of India (synchronously). House of Tagore at Santiniketan near Kolkata. The school, which was created by Tagore 'Shantiniketan'. Famous artist Nandalal Boss teaches youth. Ganges River in the evening.